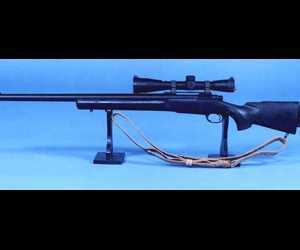 The M24 SWS (Sniper Weapon System) was developed from the Remington 700 action to replace the M21 in the U.S. Army inventory. The M24 is chambered for the 7.62x51mm NATO (.308 win) round. It has a composite stock made of Kevlar, graphite, and fiberglass, with an adjustable buttplate. A detachable Harris bipod can be attached to the fore-end. The AT1-M24 Tactical Rifle is an updated and upgraded version of the US Army's M24 sniper weapon system. It has been modified to provide superior overall performance. All components are precision machined to ensure smooth, reliable operation under the most severe operating conditions. The M24 has a maximum effective range of 800 meters (875 yards). It is fitted with a 10x42 Leupold Ultra M3A telescope sight and has detachable emergency iron sights. It has a 5-round internal magazine and weighs in at 12 lbs. Barrels are 416R stainless steel with 5R hook-cut rifling. Twist rates are optimized for use with the heavy bullets which are the norm for long-range shooting. Accuracy of the AT1-M24 is warranted by the manufacturer to be less than a minute of angle across the rifle's effective range when new, although rifles generally average under half minute of angle accuracy. Barrel life of the AT1 typically runs to at least 10,000 rounds before replacement is required. Stocks are Kevlar reinforced composite with full-length aluminum bedding blocks and are supplied in a choice of colors with a textured finish. Stocks are available with adjustable comb and length of pull. The bipod allows 15º of cant, has adjustable damping and can be attached and removed without tools. Telescope mounts are to NATO standard, quick detachable and can be remounted without loss of zero. Auxiliary sighting systems, suppressors, tool kits and deployment kits are available to customer specification. A variant, the AT1M, is chambered for 0.300 Winchester Magnum ammunition.